Hawaii’s Probation Program Is Often Copied, But Does It Work? A new study says a Hawaii criminal justice program praised nationally for improving parole and probation is not a “silver bullet” for reducing recidivism and lowering costs for supervising high-risk probationers. Hawaii’s Opportunity Probation with Enforcement rewards probationers if they don’t use drugs, meet with their probation officers and complete substance-abuse treatments. Supported by statistics showing a dramatic drop in recidivism, HOPE has been hailed as a model for other jurisdictions across the country. But the study published last month in the Criminology & Public Policy journal casts doubt on HOPE’s hope. Former Judge Steven Alm in his 1st Circuit Court offices earlier this year. Its subtitle, “Is Swift, Certain, and Fair an Effective Supervision Strategy?” uses the very words that characterize the HOPE supervision approach: “swift, certain and fair” oversight of probationers. The answer to that question, according to the study, is maybe not. The study is titled “Outcome Findings from the HOPE Demonstration Field Experiment.” It was co-authored by researchers at a North Carolina-based research nonprofit called RTI International and at Pennsylvania State University, involved a field study of more than 1,500 probationers in four counties (one each in Oregon, Texas, Arkansas and Massachusetts). The probationers were randomly assigned either to a program modeled on the HOPE approach of close supervision, or to standard probation programs. The father of HOPE disagrees. Former Hawaii 1st Circuit Court Judge Steve Alm said HOPE has had critics since he implemented it in his courtroom in 2004. When it’s done right, Steve Alm says HOPE reduces crime, helps offenders and saves taxpayers money. Alm said that when the HOPE model is employed properly — as, he argued, it has been in Hawaii, Washington, Texas, Kentucky, Michigan and other states — it reduces crime, helps offenders and their families by avoiding long prison terms and saves taxpayers millions of dollars. When the program is not executed correctly — say, focusing too much on sanctioning probationers instead of on effective probation officers and treatment providers “all in a caring and supportive atmosphere, it quite naturally is not going to work,” he said. HOPE has been commended by many for its success in improving the parole and probation systems. 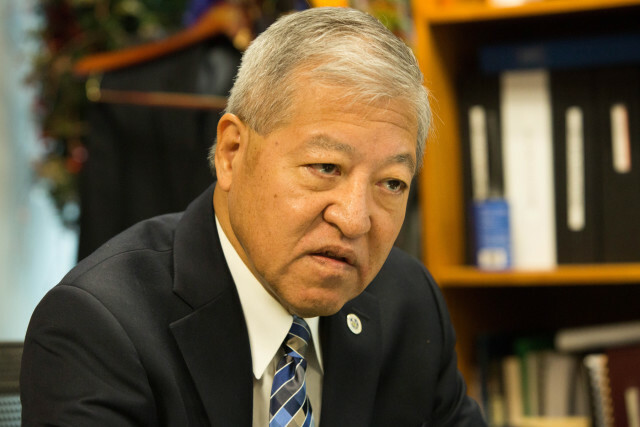 When Alm stepped down from the bench in September, his work was hailed by the likes of Hawaii Supreme Court Chief Justice Mark Recktenwald and U.S. Attorney Florence Nakakuni. 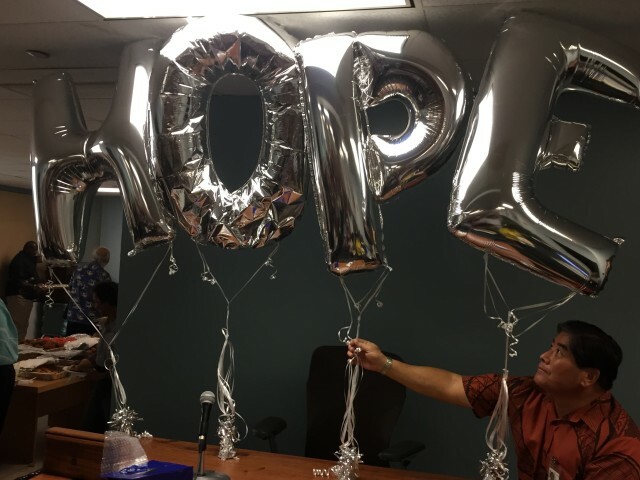 But HOPE has not been universally embraced, and its critics include Keith Kaneshiro, the Honolulu city prosecutor. 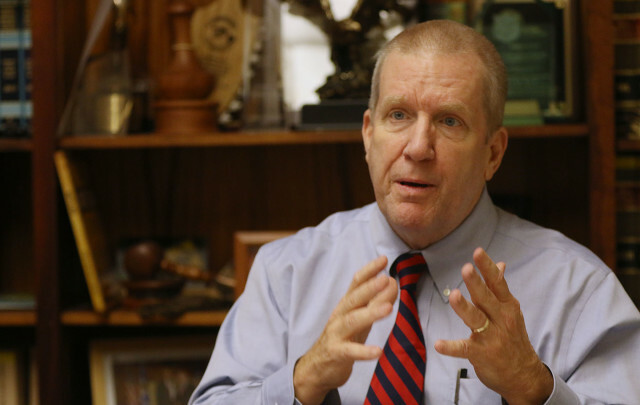 In his view, HOPE compromises public safety. Keith Kaneshiro in his Honolulu office last month. The study, whose lead author is Pamela Lattimore of RTI International, was supported by the National Institute of Justice and the Office of Justice Programs, part of the U.S. Department of Justice, though DOJ does not take a position on the report’s outcome. The November edition of Criminology & Public Policy that included the study is devoted entirely to the issue. But there are others, like an article titled “All Implementation is Local” and Alm’s own contribution to the journal, that — taken together — make for a thorough examination of HOPE and similar programs. U.S. Marshal Gervin Miyamoto adjusts the balloons in place for Judge’ Alm’s retirement party at the 1st Circuit Court in Honolulu. The main takeaway of the journal comes in the introduction by Daniel Nagin of Carnegie Mellon University. He echoes the “no silver bullet” theme of the Lattimore study but also stresses Alm’s argument that HOPE is not merely a “sanctions-only” approach but one that includes, as Nagin put it, “an opportunity arm” that includes a variety of treatment possibilities. “More generally the commentaries make clear there is no ‘one-size-fits-all’ approach to effective probation supervision. Instead effectiveness requires a nuanced and adaptive application of a multifaceted strategy,” Nagin wrote. Alm remains committed to defending, improving and expanding his program.